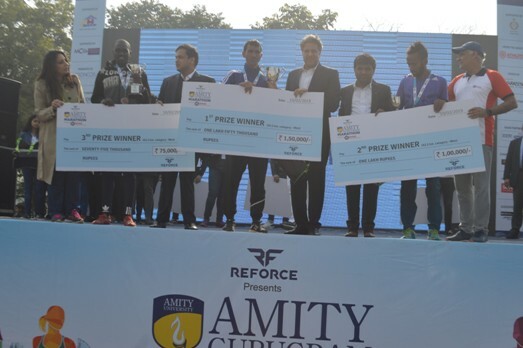 February 10, 2019| Gurugram, Haryana: Creating a fitness and health trail at Leisure Valley Park, Sector 29, Gurugram, many sports enthusiasts, renowned international runners, CEOs, Doctors, Lawyers, students, senior government officials,socially conscious citizens participated in the Amity Gurugram Marathon on Sunday, 10th February. Karan Singh, a resident of India, emerged victorious in full marathon category; Ibrahim Mukunga, a resident of Kenya, dominated the half marathon category; Manoj Singh, a resident of Uttarakhand (India), stood first in 10km run and Dhirendra Kumar Burman, a resident of India, was the winner in 5km race category. Winners were felicitated by Dr Aseem Chauhan, Chancellor Amity University and other event partners.